Futuristic roll-up phone display detailed in Apple patent | What Hi-Fi? Apple's latest patent shows a roll-up phone screen - another rumour about it investigating flexible and curved screens for its iPhone and iPad ranges. There are all sorts of rumours circulating about the iPhone 8, but one that won't go away is that it will have a curved screen. Now a new Apple patent sheds some light on what the Cupertino company could be working on: a screen that rolls up like a scroll. The patent describes barrel-shaped housing at either end of what would be the parchment bit of this futuristic scroll. The screen would retract into these housings, and extend when pulled out. The barrels would also house the device's other components, like the camera, processing unit, speakers and microphone. The patent was filed with the US Patent and Trademark Office and spotted by Apple Insider. 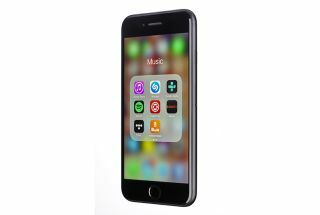 Will we see this in the iPhone 8? Probably not. But the patent notes that the screen would be flexible, and this isn't the first rumour we've heard about Apple working on flexible and/or curved OLED displays. Most recently, the iPhone 8 was rumoured to have a flexible OLED screen with a higher resolution than the Samsung Galaxy S8. There was no mention of this digital scroll though, so we'll assume this is one for the distant future. However, companies regularly patent designs that never come to fruition, either because they never make it past the drawing board, or because they want to throw competitors off the scent while developing other tech. The iPhone 8 is rumoured to come in three varieties. The top-end model - dubbed the iPhone X to celebrate the smartphone's 10th anniversary - is said to cost around $1000.